Code Name: Papa - How Far Would You Go to Save Your Child? Aliyah Burke's, Code Name: Papa, is an explosive thriller and I can honestly say it seemed the pages turned by themselves. To say I was immersed in this story would be an understatement. A little backstory: Indigo and Beckett were government operatives when they fell in love eight years earlier. After learning she was pregnant, Indigo wanted out of the lifestyle, wanted to spare her child from all of the danger associated with being a spy. She "went dark" or "went off the grid" without even saying a word to Beckett about the child they had conceived. Present day: Indigo is mad, and I don't mean angry. Her seven-year-old son (Sean) was kidnapped and she has been given a list of 10 people she must kill before she gets her son back. All of her hopes of remaining a stay-at-home mom who makes cookies and waits to welcome her son home at the end of the school day goes up in a cloud of smoke. Although this story has a twist concerning the murders, my question is this: what would you do? How far would you go to save the life of your child? I've been thinking about this question since finishing the book, and I've discovered that I have no clear answers. I'd like to think I'd do anything for one of my children, or one of my grandchildren, but to take a human life would be a huge deal. The only way I could begin to justify my actions would be going with the mentality of "kill or be killed." Even so, I'm sure I would tremble and shake at such a thought, much less trying to carry it out. I fully realize this story is fictional but it drives home the point that we have protective instincts toward our children. Whether their lives are endangered, whether they are being bullied and their peace of mind is shattered, or whether they lay dying in a hospital bed or are trying to recover from an illness, we always want to protect our children from harm, sadness, emotional stress and pain. It's in our nature; it's who we are and, often, what we do best. 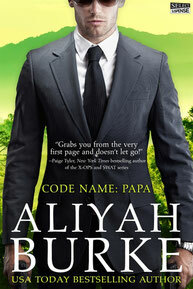 I cannot encourage you enough to give Code Name: Papa by Aliyah Burke a chance. If you would like to read this action-packed crime-fiction thriller suspense novel, feel free to visit its page on Amazon.